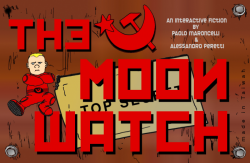 The Moon Watch (Paolo Maroncelli and Alessandro Peretti; 24-Nov-2008; Glulx). One Room Game Competition 2008: 1st place of 7 entries. XYZZY Awards 2008: Winner of Best Use of Medium. The Moon Watch (Paolo Maroncelli and Alessandro Peretti; 02-Jan-2009; Glulx). The Moon Watch - at IFDB. The Moon Watch - at ifwizz interactive fiction (in German). This page was last modified on 28 June 2016, at 15:37.